When Mme Guizot and her sons were taken to Geneva by her father, M. Bonicel, in August 1799, the city known as “the Protestant Rome” had approximately 25,000 inhabitants, not many more than Nîmes. The two towns, mainly for religious reasons, had had very close ties for a long time and the Guizot family, living on the edges of Lac Léman, were in familiar territory amongst many relatives including the families Peschier, Dumas, Laurens and the famous artist Henriette Rath, whose adopted daughter Clémentine was the first girl to attract the young François. Mme Guizot had chosen this somewhat costly destination to ensure that her two sons received the best possible education, which lasted until 1805. 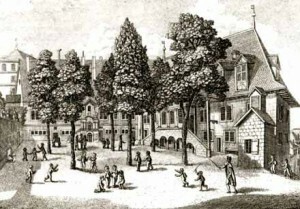 The three of them lived modestly at 3 rue de la Verdaine, but François benefitted greatly from the teaching provided by the College and then the School of Philosophy originally established by Calvin. His teachers, Charles-Antoine Peschier and Pierre Prévost, opened up his mind to books and ideas to which he would never have had access in his town of birth, and the cosmopolitan environment in which he moved introduced him to languages and foreign influences. In 1859, he wrote to a friend from Geneva: “Geneva is my intellectual birthplace”. He made friendships there that would last his whole life, even though he only returned to Geneva once in August 1807, to meet Mme de Staël in Ouchy. These valuable years of learning made Guizot a sort of honorary citizen of Geneva, a distinction sometimes mentioned by his opponents. The Geneva professor Auguste de La Rive wrote in 1845 to Tocqueville: “They sometimes say to M. Guizot, when they want to insult him, that he is from Geneva, and I have to say I am very proud of that.” Three years later, expelled from France by the revolution of 1848, Guizot confided to his old friend Henriette Rath: “I have often said to myself that in hard times, it would be in Geneva that I would find safety and liberty… I have memories of Geneva that will never leave me.” But he wrote this from the suburbs of London.